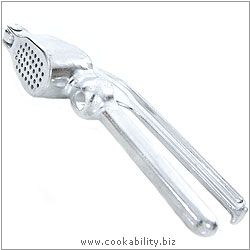 We are frequently asked for a low cost, simple to use garlic press with a cherry pitter in the handle. This one is lightweight aluminium construction and cheap. However, it is not very robust, so care is needed to remove the garlic skin before use and press just a clove or two at a time.